Excel Compiler, Workbook Copy Protection Software.VBA Protection. Excel Compiler, Workbook Copy Protection Software.VBA Protection. Excel workbook copy protection software. Excel Compiler. 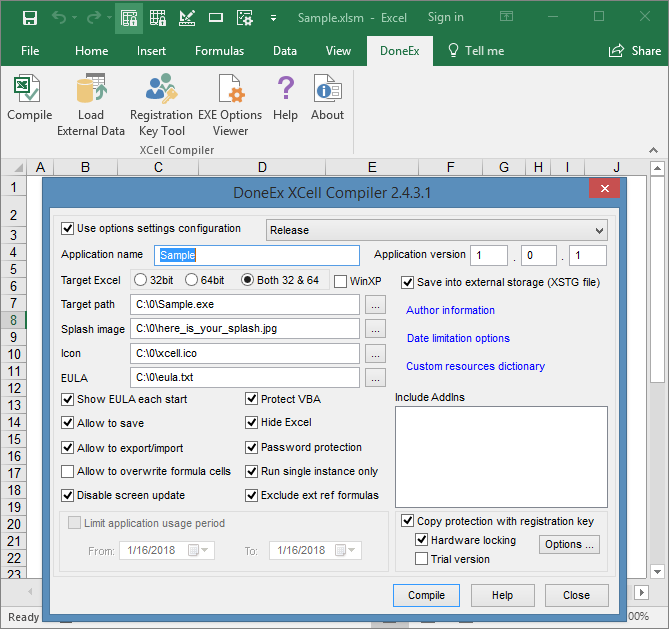 The DoneEx XCell Compiler ensures the strongest copy protection for Microsoft Excel workbooks. The product compiles your workbook into an executable application (EXE file) where all of the formulas are secured and converted into binary format. This binary format cannot be restored back into the original Excel formulas. We have created our own formula calculation engine. It replaces Excel’s formula calculation engine and is the only way to provide the strongest protection for all formulas in a spreadsheet. Microsoft Excel itself is used for the formatting and displaying of the calculated results. The product ensures solid security of VBA code by using complex solutions, which includes making VBA Project unviewable, obfuscating the VBA code and removing literals (such as static string values and numbers) from the VBA code. When using this solution, the whole VBA project becomes securely protected from being copied through a simple ‘Compile’ button click. You do not need to be a programmer or an Excel expert to use the product. With registration/license management feature you can protect your workbook from being illegally copied from one computer to another through the use of a hardware locking mechanism. You can to add your own splash screen image, icon, End User License Agreement (EULA) and do much more…. Try a free trial version of Excel Compiler! The trial version comes complete with all functional features for formula and VBA protection. You can completely prevent piracy of your workbook by applying our copy protection. It is impossible to restore the original workbook from the compiled version. You get secure Workbook copy protection with software activation keys or hardware dongles. By converting all workbook formulas into binary code, our product ensures the maximum level of copy protection available on the market. You do not need to pick and choose what formulas you need to secure. All of the formulas in the workbook will be protected after compilation. Strong and reliable VBA code copy protection through just one click. You do not need to select what piece of your VBA code you need to protect, the whole VBA project will be protected. Royalty free distribution of your protected workbooks. You may compile and distribute as many workbooks as you want. Compile Excel workbooks (XLS, XLSX, XLSM, XLSB files) into an executable application – EXE file (which requires MS Excel to run). Create a Trial/Demo version of your workbook and control the number of days it may be used on a customer’s computer and show a trial termination warning with your content. Use unique features to hide MS Excel on start. Our Excel Compiler has been successfully protecting Excel workbooks of many satisfied customers for MORE THAN 12 YEARS! See our testimonials.